Over the past dozen years, we’ve lived in a lot of different homes and had a lot of different furniture. Each time we move, my husband and I work hard to make the most of our bedroom spaces. 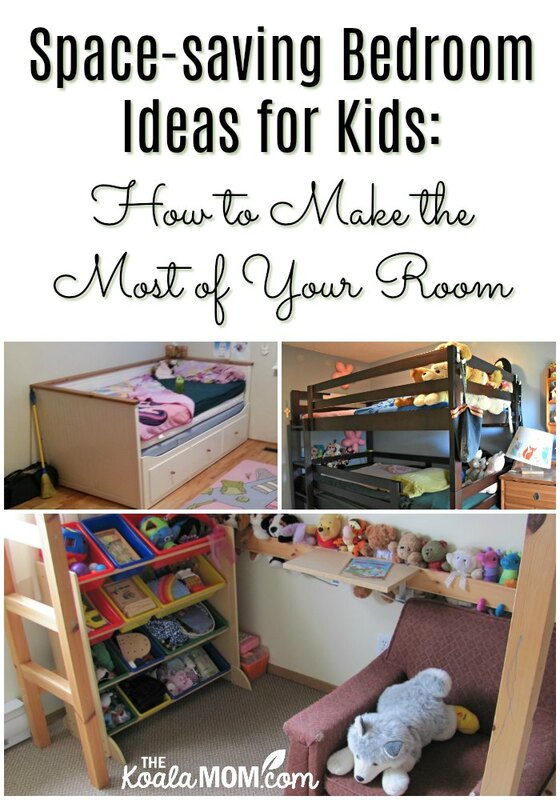 As our family has grown, we’ve come up with a lot of space-saving bedroom ideas for kids. Beds take up a lot of space in any room, so I really like beds that multi-task and allow kids to do more than just sleep in their rooms. If you’re also looking for ways to make the most of your child’s room, here are my ideas for furniture that does double-duty. Here in Vancouver, as in many other big cities, we’ve noticed an increase in home prices and a decrease in the size of new homes being built. Many families are trying to fit into smaller spaces as cities experience densification. Currently, we are a family of seven living in a three-bedroom condo. Here, I’ll share how we are making that work, and some other ideas we’ve played with over the years. If you’re also trying to make a small home work for a growing family, I hope my space-saving bedroom ideas for kids will inspire you! A small change in furniture can make a big change in your home. And this change doesn’t have to be expensive. While I’ve included affiliate links to help you start your search on Amazon, I’d also suggest watching for sales and checking used furniture ads in your local city. 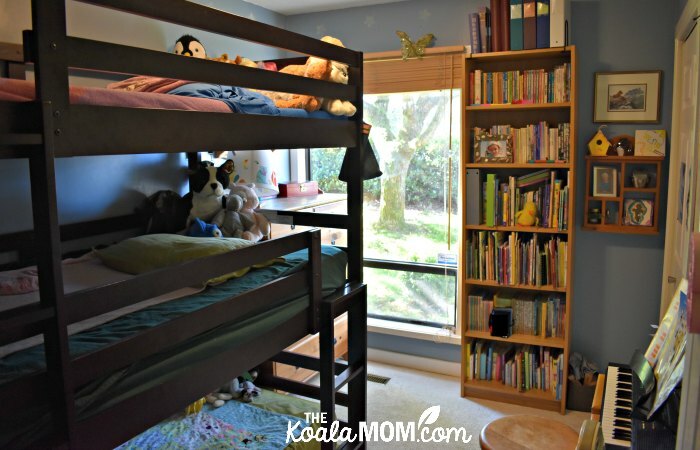 One of the most obvious space-saving bedroom ideas for kids is a bunk bed. Even better is a triple bunk bed with three children sharing a room! Our middle three girls currently share a room with a triple bunkbed. 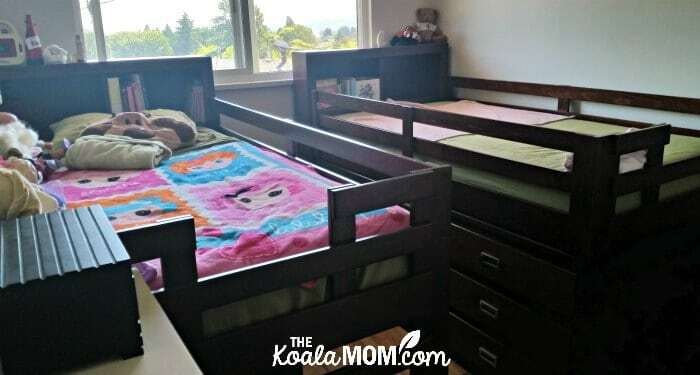 Three-year-old Pearl sleeps on the bottom bunk (basically a mattress on the floor), five-year-old Jade sleeps in the middle bunk, and eight-year-old Lily has the top bunk. They love sharing a room together. In fact, the younger two often won’t fall asleep until Lily gets there. And when we stopped at a hotel on our way to Alberta for Christmas this year, Jade and Pearl both wanted to share a bed with Lily. Our triple bunk bed is tall and sturdy. It gives each of the girls their own space. Currently, they share a fairly small room, but they still have room for a large dresser, bookshelf, and keyboard in their room. 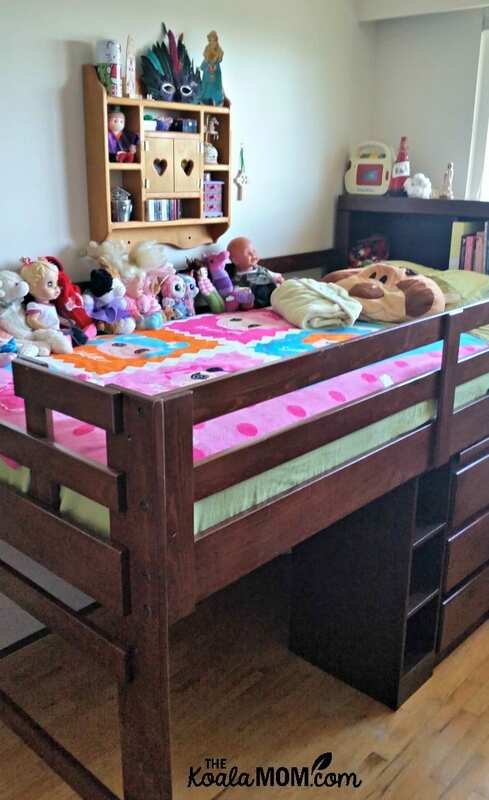 A friend of mine with five kids also has her three daughters in one room with a triple bunk bed. Their room includes floor space to play on, a tall dresser, plus a corner chair and lamp for reading. Think bunk beds aren’t cool? Check out the DIY Mommy’s rustic glam double kids’ bedroom reveal for ideas on how to make the bed into the focal point for the entire room. Over Christmas, my mother-in-law got all the girls new sheet sets which help make their triple bunk bed look more coordinated. Little changes like that, or the accompanying furniture in the room, can change the entire tone of your room, even if multiple kids are sharing a room. A captain’s bed has drawers underneath the bed for storage. Sunshine sleeps in an Ikea HEMNES daybed, which has three large drawers below a twin mattress. This has been great for our younger kids, as the drawers are close to the floor and easy to access. For a while, we had no dressers because I found the girls couldn’t use the higher drawers in the dressers anyway. 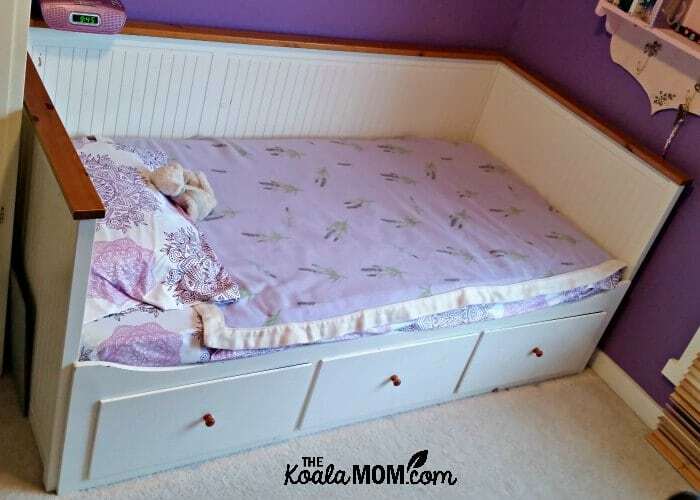 And with drawers under the bed, there’s no worry about kids pulling dressers over on themselves! The bed I’ve been eyeing for our master bedroom is a king-size captain’s bed. I love the idea of having all our storage under the bed, freeing up more space in the room. My husband can keep his clothes on his side of the bed and I can keep mine on my side of the bed. You could also use these drawers for sheets and bedding or other storage. Another space-saving bedroom idea is to take the bed out at night and to put it away during the day. This can work well for having company over. Sunshine’s HEMNES bed is also a trundle bed, which we pull out when we have overnight visitors. My in-laws, my aunt and uncle, and other guests have enjoyed the king-size bed that the HEMNES becomes when pulled out. This way, we can invite company to stay with us even though we have a small home. Many other beds come with trundle options. For example, before buying our triple bunk bed, we also looked at trundle bunk beds. This is a regular bunk bed with a trundle bed underneath. That way, if we didn’t need all three beds all the time, one was out of the way. If your kids frequently have friends over for sleepovers, this would be a fun bedroom idea! A loft bed is a taller bed that gives you space underneath the bed for other furniture, like dressers, desks, or chairs. Before Jade (our third) was born, Sunshine slept in a loft bed while Lily slept in the captain’s bed. They had space in their room for a toy bin and a big comfy chair as well. The drawers in the captains’ bed were big enough that both of them could keep their clothes there. Loft beds come in different heights. Ours was a very tall, sturdy wood loft bed. After Jade was born, I put her playpen under the loft bed and all three girls still shared a room. The loft bed was tall enough for me to step underneath while just bending slightly. 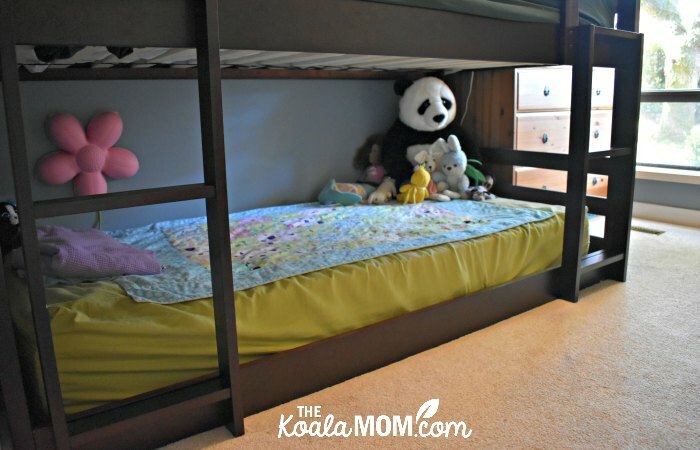 Other loft beds are shorter but would still provide comfortable space underneath for a child. You could also add shelves on or near the bed for extra storage (our loft bed came with a little shelf that hooked over the rail). We also had a set of loft beds that were only four feet off the floor, with just enough space underneath for dressers. This set came with two dressers and a shelf between them. These beds provided a bit more storage than the captain’s bed, as the dressers combined had six drawers in them. The dressers were only about half the depth of the beds. This left space behind that could either be used for long-term storage (how often do you want to slide the dressers out?) or for the kids to play in (as we had above). These beds were a better height than a tall loft bed for a younger child, but I found the space underneath them a little less useable. We did fit two of these beds into one bedroom, but it was a large bedroom and it was still tight. These beds each included a bookshelf headboard and a staircase (with two more drawers), so they became quite large. When we bought our condo, we knew they wouldn’t fit into the girls’ new bedrooms and we sold them. 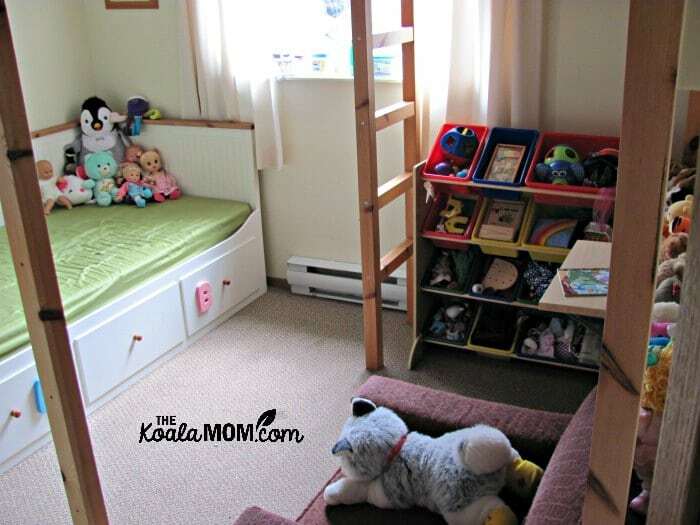 Another space-saving bedroom idea for kids is this DONCO Kids loft bed, which has a dresser and bookshelf underneath as well as a pull-out desk. This provides a great option for a school-age child to have a study space during the day, without losing a lot of bedroom space. (Having the desk hide away is also incentive to keep it clean!) There’s still extra storage space behind the dress and bookshelf if needed, yet the bed isn’t as tall as a bunk bed (and would thus fit a teen as well). During my early teens, I slept on a hide-a-bed. Every night, I’d turn my couch into a bed, and every morning, I’d fold it away again. During the day, I had more space in my room and a comfy couch on which to read, cross-stitch, or study. At night, I had a double bed to stretch out on, which was handy when I had friends over for sleepovers. A hide-a-bed doesn’t free up as much space in a bedroom as the previous ideas. And pulling the bed out every night and putting it away every morning can get tedious. This is a better idea for a den that can also convert to be a bedroom, or a basement rec room that may double as a guest room. A futon is similar to a hide-a-bed in that you can turn a couch into a bed. For the first ten years of our marriage, we had a futon in our living room. If company came over, we pulled it down to create a double bed for them. Again, this option doesn’t work as great for a regular bed but it does help you create “guest” space in a small home. There are now some very stylish, comfortable options for futons. Have you tried any of these furniture ideas? What space-saving bedroom ideas for kids would you share? Great ideas! We have a three bedroom home for our family of seven and like you, we use a triple bunk for the boys. It’s great! Currently the baby is in our room but we’ll be moving her into our daughter’s room and I’ve been puzzling over how to fit everything in her room. There are windows on two walls and the closet is awkwardly placed. I think the daybed with drawers would be the best option, plus it would match our other HEMNES furniture down the road. ?